The quality of your sleep depends largely on the level of comfort of your sleeping surface. According to a recent survey, over 40% of the people have disturbed sleep cycles with less than 7 hours of sleep every night. It not only takes a toll on your mental health, but decreases your energy and sets you off to a bad day. The first step in rectifying this problem is to create a comfortable and cozy sleeping environment around you. The best cooling mattress pads can greatly help you with that. Cooling mattress pads are a growing industry that benefits people of all ages and significantly improve your sleep quality. Read our latest guide about the best heated mattresses pads. A cooling mattress pad is essentially a mattress topper that is made with special materials designed to absorb excess heat. It regulates the body temperature as we sleep and allow a healthy and steady flow of air. Our body temperature plays a key role in determining the quality of sleep we get at night. It affects the REM cycles and a heightened body temperature can keep you restless and disturbed, causing you to wake up several times during the night. Some people also tend to sweat a lot and need a breathable surface to feel comfortable. Read our complete guide about the best bamboo mattresses pads. A cooling mattress pad will keep your body cool and dry. They come in a number of designs and materials to choose from depending on your requirements. The proactive heat management and breathability of these cooling mattress pads will send you off to the finest sleeps of your life. The best cooling mattress pads can broadly be classified as active and passive types. 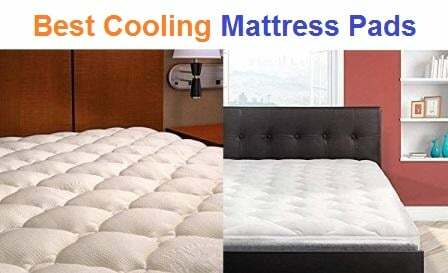 An active cooling mattress pad is one which is mainly run via electricity to regulate the temperature of the topper. It can make use of water that changes temperature and is designed like a tubing network. The thermoelectric technology used for this type of cooling mattress pad makes use of water and coils. The complete unit has an outer motor and controllers through which the temperature can be controlled by the user. This customizable variety gives you the freedom to set your ideal sleep temperature. A passive cooling mattress pad is the second and most common type of mattress pad available in the market. They are simpler to use and don’t use electricity or motors. They are simply constructed with special materials that aid in heat management. They are highly absorptive, breathable and light. Some materials are inertly cool, like natural latex that comes from the sap of rubber trees, feathers and wools. Most cooling mattress pads also make use of gel infused memory foam, also known as viscoelastic poly-foam. This poly-urethane based material is treated with special chemicals that makes it extra soft and sensitive to changes in temperature. It contains cooling gel beads or swirls that regulates the body temperature. The covers of the cooling mattress pads can be made from bamboo, rayon or cotton. Some advanced models make use of phase changing material (PCM) that absorbs excess heat and maintains a steady body temperature that is comfortable for the sleeper. You may also find some cooling mattress pads that are required to be refrigerated prior to being used. However, they are quite rare. Cooling mattress pads are very beneficial for your body and well-being. Here are some of the benefits you can enjoy by getting yourself one of these toppers for your mattress. A cool and comfortable sleeping surface helps you fall asleep faster than an uncomfortable one. A cooling mattress pad will generate a cool and dry surface that not only keeps you comfortable, but also regulates a cool and steady body temperature throughout the night. It will help you get a full night of undisturbed sleep. The special materials of a cooling mattress pad makes it highly breathable, so it regulates a steady air flow throughout the night. If you break out into sweats at night, your sleep will not be disturbed by it, as the quality materials of the cooling pad will absorb excessive moisture and keep you dry and cool. Most cooling mattress pad surfaces are treated with antimicrobial agents that prevent bacterial growth due to moisture. It is clean and hygienic. It also protects the mattress from stains and bacteria owing to its moisture-resistant, hypoallergenic and antibacterial properties. This reduces any triggers to asthma or allergic reactions and prevents mold formation on the mattress. The extra soft, plush surface of a cooling mattress pad follows the natural contours of your body to give you a comfortable and gentle sleeping surface. It can also turn an uncomfortable mattress into a plush, comforting bliss. The cooling mattress pads can greatly help in relieving back pain and muscle aches. It doesn’t put any pressure on your back and lets the spine stay in its natural curvature. The pressure relieving cushioning in shoulder and hip areas provide ample support, preventing the body from sagging. The most important thing about the best cooling mattress pads are their effective temperature regulation technology. Make sure that you know well about the materials and what works best for you in this regard. Gel infused memory foam with cooling beads or coils is well received by most people and a breathable and durable material will not only help you with your sleep but also increase the durability of your mattress. Thickness and firmness is another thing to consider while buying the cooling mattress pad. This may depend on your mattress itself. If you find your sleeping mattress firm or uncomfortable, buying a thick and soft cooling mattress pad will rectify this problem. Extra soft cooling mattress pads have pressure relieving points that help with body aches and tensed muscles. They also keep your spine naturally aligned and keep your body comfortable and cool throughout the night. Durability is possibly the most important quality to look for in any product that you purchase. Some materials are superior to others in terms of durability. The active cooling mattress pads have a complex design that require an external output as well, due to which they are also prone to breakdowns or malfunctions more commonly. A passive cooling mattress pad with high quality materials will last a long time and also keep your mattress good as new. Also, in active pads the electrical components can create a dull noise which might disturb your sleep. In this regard, the passive cooling models are quieter and comfortable. Latex, wool and memory foam are virtually silent, whereas other material like feathers may have some rustling sound with movements. Make sure that the product you purchase is hypoallergenic and antimicrobial. This also prevents odor and keeps your mattress clean. The material should be breathable enough to let your sweat dry out naturally without causing any discomfort. A lighter and softer cooling mattress pad that fits well around your mattress doesn’t move from place during your movements. Most cooling mattress pads can be machine washed and are fairly easy to clean and maintain. They don’t require any additional upkeep. Get a product that is backed up with warranty. Here are some of the best cooling mattress pads available in the market. The extra thick bamboo cooling mattress pad is a versatile product that fits all mattress sizes and revitalizes your sleep. 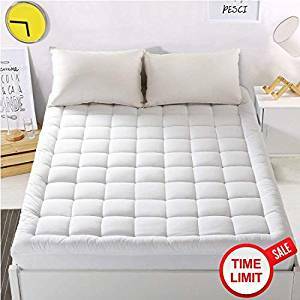 Convert your sleeping surfaces akin to the 5 star hotels sleeping beds with this extra plush and super comfortable cooling mattress pad with extra filling. It makes use of advanced fiber fill technology to support and comfort your body while maintaining and regulating a steady body temperature. It will keep your sleeping surface cool and dry throughout the night. The fabric is silky to touch and ultra-comfortable and relaxing to sleep in. The dimensions of this cooling mattress pad are 76×80 inches with 18 inches depth, making it extra thick for your uncomfortable, firm or stiff mattress. With 30% more loft, it is quite dense and comfortable to sleep in. The state of the art fiberfill technology used for the construction of this topper gives it a silky and plush feel. The Revoloft fiber has a feathery feel without the use of any real feathers that can trigger allergies. You can feel the comfort and coolness under your skin as you lie down for a restful night of undisturbed sleep. The cooling mattress pad is completely noise free even during movements and fits well around the edges of the mattress. It works well on latex, memory foam or innerspring mattresses and greatly increase their longevity. The topper has a 160 thread count cover along with double needle baffle box stitch that doesn’t displace of shift it during movements. The extraordinary and exclusive, advanced fiber technology makes the cooling mattress pad 100% hypoallergenic. It keeps the mattress odor free and prevents the formation of mold. It also prevents stain and bacterial growth, giving you a clean and hygienic sleeping surface at all times. The thick and plush material is breathable and absorbent. The product is backed up with a money back guarantee and an excellent customer service. Extra thick and plush material with a soft and silky feel. Material on the sides is quite thin and can tear when stretched. Enjoy the luxurious and plush comforts of the best cooling mattress pad by Bamboo Mattress Pad. 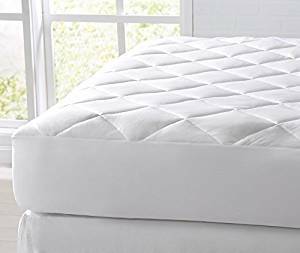 You wouldn’t find the likes of this mattress pad anywhere else. The comfortable and deluxe feel and look of the cooling mattress pad will turn your mattress into a 5 star bedding. Made with breathable products and highly durable construction, this cooling mattress pad will last you over several years and add years to the longevity of your mattress as well. This king sized cooling mattress pad is 76×80 inches in dimensions and 18 inches deep. It is a safe, tested and certified product made with high quality and durable materials. It has a soft and plush rayon from bamboo cover filled with RevoLoft Cluster Fiber that is also hypoallergenic and antimicrobial. 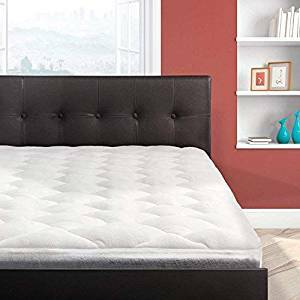 The backing is made of 70% polyester and 30% cotton and the skirt of the mattress pad is 76% polyester, 16% nylon and 8% spandex to make it stretchable and fit well around the corners of your mattress without being displaced during movements. 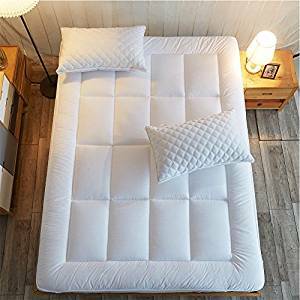 This cooling mattress pad also features a removable pillow top mattress pad that will make you feel like you are resting on a cloud with great comfort and support to your neck. The material is quite breathable and prevents the buildup of sweat or moisture by allowing a steady air flow throughout the night. This keeps the surface cool and dry at all times. The Revoloft fiberfill adds comfort and great qualities to the cooling mattress pad. It doesn’t allow any bacterial contamination, preventing the mattress from molds or odor, and preventing any allergies or skin irritation. It has a smooth and cozy feel that will relieve you from tiredness and stress after a long day. The skillful fiber technology also ensures that the mattress pad is completely silent and makes no noise during any movements. With 160 thread count cover and a double needle baffle box stitch, you can’t go wrong with this purchase. Comfortable and durable cooling mattress pad. Needs delicate washing and maintenance. The cooling mattress pad by Cardinal & Crest is one of a kind. It is made from materials that have a genuine cooling effect, and the engineering of the mattress topper is such that it supports your body and helps relief aches and pain. 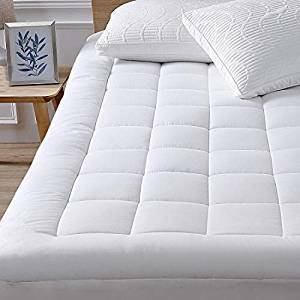 You’ll find a generous amount of cool, hypoallergenic fill inside the cooling mattress pad that keeps your sleeping surface dry and comfortable for you throughout the night so you can enjoy a restful and undisturbed sleep. This cooling mattress is 72×84 inches in dimension with an 18 inches depth, and fits a king sized mattress perfectly. It is filled generously with a cooling and hypoallergenic Revoloft material that has a greater cooling effect than cotton and polyester alone. It is quite breathable and allows ample air flow and also traps air within its beaded network to retain its shape. This allows you to have a comfortable and plush sleeping surface that’s relaxing and cool at all times throughout the night. It supports your spine and natural curvature to relieve body stress and aching muscles. The product is lab tested and certified and is safe to use. The hypoallergenic material doesn’t let bacteria or bugs fester within the mattress, increasing its longevity and also preventing any allergic triggers. It keeps the mattress mold and odor free and gives you a clean and dry sleeping surface. It is plush and soft with a 160 thread count cover. 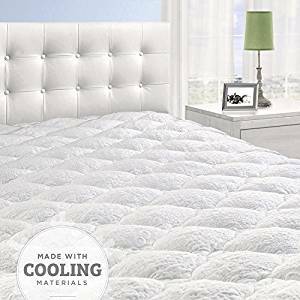 The cooling mattress pad is skillfully crafted with outstanding fiberfill technology that gives you softness and plushness along with cooling and breathability. It traps air within its structure to help the pad retain its shape for a longer time. This allows an increased air flow, which can be beneficial especially if you tend to sweat while you sleep. The product is backed up with money back guarantee and excellent customer service. The cooling mattress pad by Shilucheng offers you deluxe comfort with its state of the art fiberfill technology. It has plush, soft and relaxing feel along with a cooling effect that keeps your sleeping surface comfortable, cool and dry all night long. The skillful craftsmanship and technology that goes into the manufacturing of this product makes it an excellent choice for your bedding. It not only keeps you comfortable and improves your sleep cycles, but also protects and add years to the durability of your mattress. This king sized cooling mattress pad is 78×80 inches in dimension with a depth of 8-21 inches. 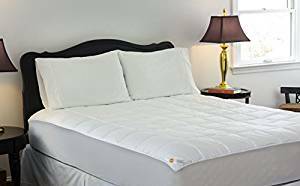 It is constructed with 300TC 100% cotton and has a breathable 6D hollow siliconized fiber filling that sets it apart from every other bedding product in the market. This advanced technology regulates the temperature all night long, making the surface cool and dry at all times, even if you sweat while sleeping. The mattress fits well around a regular mattress, as well as an air mattress, waterbed or memory foam. It is hypoallergenic and protects your mattress against mold and odor. If you are unhappy with the firmness or contours of your mattress, this cooling mattress pad can greatly help you with that. It converts an ordinary mattress into a 5 star bedding experience due to its plushness and comfort. Shilucheng’s cooling mattress pad is made from durable materials that last a long time and also increase the life of your mattress. It is a low maintenance product that can be machine washed in cold water and tumble dried on low without losing its integrity. Make sure that you don’t use any harmful chemicals or bleach while cleaning it. The fabric of the mattress pad is crinkle resistant to retain its crisp and neat look. Do not iron this product. It comes with a money back guarantee and excellent customer service. 6D hollow siliconized fiberfill technology. The padding isn’t very thick. The cooling mattress pad by Outlast is the first ever bedding product with temperature regulating material that has the Certified Space Technology seal of approval. The product was initially developed to be used exclusively by NASA and is now available for everyone who experience night sweats and an uncomfortable sleeping surface. The Outlast cooling mattress pad wicks away excessive heat and prevents the built up of heat or moisture from perspiration. The excellent temperature regulating technology coupled with superior comfort and durability gives you everything that you need for a 5 star sleep! Many a times while sleeping, our body can heat up due to the non-breathability of the sleeping surface, which leads to sweating. The cooling mattress pad by Outlast absorbs the excessive heat generated by your body before you break in to sweat. This is due to the advanced technology that’s used for the manufacturing of this bedding. It has micro capsules within its structure called ‘Thermocules’ that regulate the temperature, creating a micro climate around you that keeps your sleeping surface cool and dry. When your body starts to cool down, the stored heat is then released back to the body, making your sleeping surface dry and comfortable all night long. Enjoy a restful night of undisturbed sleep and say goodbye to the restless tossing and turning due to sweating or overheating. The cooling mattress pad is made with a 100% polyester fiber fill and 350 thread count. It is certified gold liner with 100% cotton sateen weave that gives it a luxurious look. 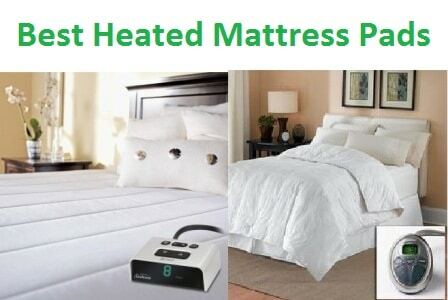 The Outlast mattress pad absorbs excessive heat, stores it and releases it to maintain a constant comfortable temperature and balance it around your body. You will notice a visible decrease in night sweats and thermal incompatibility. It can fit most mattresses and has an 18 inches depth. The cooling mattress pad also protects your mattress from odor build up or molding, which adds years to its durability. The material is hypoallergenic and backed with an excellent customer service. The cooling mattress pad by Great Bay is made with high quality, temperature regulating materials that are quick to respond to even the minor change in your skin’s warmth. Enjoy a restful and undisturbed night of sleep in any weather. This cooling mattress pad will keep your sleeping surface cool and dry all night long and prevent the break out of sweats. 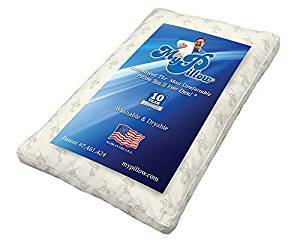 The Great Bay Home cooling mattress pad is made from 100% polyester fiber fill which is highly breathable and allows a steady flow of air to and fro the fabric throughout the night. It senses a change in temperature and regulates temperature before you break into sweat. The cover of the mattress pad is also made from 100% microfiber. The hypoallergenic material of the mattress pad prevents all sorts of allergies, including itchy throat and flu like symptoms after waking up. This microbial control also protects the mattress from odor and mold, greatly increasing its durability. The cooling fibers incorporated within the design of the cooling mattress pad creates a sleeping environment that’s relaxing and comfortable. You will notice a significant decrease in the amount of tossing, turning and restlessness due to sweats or heat buildup at night. The cooling mattress pad is available in Twin Size with 39×75 inches dimensions, Full Size with 54×75 inches dimensions, Queen Size with 60×80 inches dimensions and King Size with 78×80 inches dimensions. The side pockets are 15 inches that stretch to fit up to 18 inches deep mattresses. It is a strong and durable material that fits well around the corners and prevents any displacement during movements. The cooling mattress pad is fairly low maintenance and requires machine wash in cold water and can be easily tumble dried. Do not iron or use harsh chemicals and bleach on the topper. The product is highly durable and backed up with excellent customer service. Cooling fibers for temperature regulation. 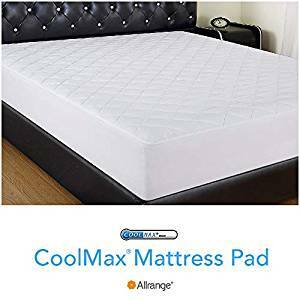 The cooling comfort mattress pads by Allrange are guaranteed to provide you a full night of undisturbed sleep with their innovative design and exclusive Coolmax technology. It not only ensures a restful sleep for you, but also protects your precious mattress and adds years to its longevity. It is comforting and supports your natural curvature, releasing body pains and muscle aches. The breathable and high quality materials will balance out the temperature and keep your sleeping surface cool and dry all night long. Many a times at night, we break into sweat due to changes in temperature or even night terrors, and it takes a long time to fall back asleep. With Allrange cooling mattress pad, the responsive material of the mattress pad senses this change in temperature and regulates and stabilizes it before you break into a sweat, preventing restless. It also absorbs excessive moisture to give you a clean and dry sleeping surface so you can wake up fresh and well rested. The moisture wicking technical fibers were first developed in 1986, and since then they have greatly improved in their functionality to bring you a more advanced and innovative design. The specially engineered polyester fibers used as a filler for this mattress pad makes the product highly breathable compared to other natural fibers used in beddings like cotton. It draws away moisture from your skin via a capillary action and enhanced evaporation. This balances out any rise in temperature and prevents heat built up. This cooling mattress pad fits over most mattresses and is 78×80 inches in dimensions with a 16 inches depth to fit well around the corners. It is a mix of high quality cotton and Coolmax fabric along with a deluxe diamond stitch quilting pattern which also prevents creases and clumping of the fabric. The materials are hypoallergenic and machine washable with easy care and maintenance. In order to have a productive day, it’s very important to get a restful night of sleep. This product will help you get that with its moisture wicking and temperature regulating qualities that give you a snug and comfortable sleeping surface that is cool and dry all night long. The material conforms to the natural curvatures of your spine and supports your body, relieving muscle aches and strains. Get this cooling mattress pad to enjoy a restful night of sleep and also increase the longevity of your mattress. Plush Rayon from Bamboo cooling mattress pads are filled with RevoLoft Cluster Fiber. This material is extremely plush and comfortable. It follows the natural curves of your body and releases stress and aches. The material is hypoallergenic so you will never wake up with flu like symptoms again! It prevents microbial growth which causes allergic triggers and also prevents your mattress from getting odor or molds. If your mattress is too stiff or firm, it can greatly help with that as well, as it provides a comfortable and fluffy cover on top of it. The backing of the mattress pad is made from 30% cotton and 70% polyester fibers. The skirt is stretchable and made from 76% polyester, 16% nylon and 8% spandex. It fits well around most mattresses and fits well around the corners to give you a solid and non-displaceable cover even during movements. The Revoloft state of the art fiberfill technology gives you the feel of an authentic goose and duck down without the use of the actual feathers which can trigger allergic reaction in some people. The fabric is highly durable and easy to wash and maintain. Note: This particular product has a few manufacturing defects including small holes where the two bolts of fabric should ideally merge in the middle with some irregular stitching or stains. The price of the product is lowered due to it but it doesn’t affect the breathability and cooling effect of the product. Can have some manufacturing defects. When it comes to Leisure Town Bedding, your voice and opinions are heard. According to all the customer feedbacks, many alterations and upgrades are continually made to their products to bring you the best quality and design. Their new cooling mattress pad is upgraded to have optimal thickness to provide you the comfort and luxury you deserve. The product is tested by professional sleeping testers and sealed in vacuumed bag to retain its design and integrity. 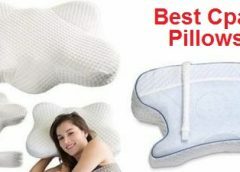 It provides you a great and comfortable sleeping surface all night long. The material used for the manufacturing of this cooling mattress pad are highly breathable. They allow a steady air flow throughout the night so that any sweating or excessive moisture is absorbed and evaporated over a large surface area. It senses minor changes in the body temperature and regulates a steady and optimal temperature to keep you comfortable and dry. The sleeping surface is cool at all times and is moisture wicking with its excellent fiberfill technology. The fibers are also hypoallergenic and antimicrobial. This prevents any allergic triggers that you might have, especially by sleeping on surfaces that have a feather fill. Say goodbye to flu like symptoms after waking up, sneezing and runny nose. It also protects your mattress form odor and molds by preventing microbial festering. The cloud like surface will give you the exclusive luxury and comfort of a 5 star hotel bedding every night. It has a 300 thread count and made from 100% cotton that is breathable and light. It give superior comfort and also conforms to the natural contours of your body to release any strains or aches you might have after a long tiring day. The mattress pad fits well on a king sized bed with 78×80 inches dimensions and 21 inches depth. The side skirts are stretchable to fit perfectly around the corners. The product can be machine washed in cold water and tumble dried. Needs gentle and careful washing and maintenance. Cardinal & Crest have unique beddings and mattress pads that meet the demands of their customers. They are constantly updating their materials according to user’s feedbacks to bring you the best comfort and quality. Their cooling mattress pad is one of a kind, with a genuine moisture wicking and cooling technology and superior breathability. Enjoy a cool and dry sleeping surface and say goodbye to waking up with flu like symptoms and allergies. The high quality products used for the manufacturing of this product are highly durable and built to last. They provide extra comfort and luxury to your beddings with its thick and plush surface and cooling effect. The cluster fiber fill used along its thickness traps air to maintain a steady shape of the mattress and conforms to the natural contours of your body. It releases stress and pressure points in your body and provides plushness and suppleness, sending you off to one of the finest sleeps of your life! The elastic skirt around the cooling mattress pad fits perfectly around the corners of the mattress and is 18 inches deep with a stretchable material that doesn’t make the topper move with movements. The mattress pad fits a Queen sized mattress with 60×80 inches dimensions. The moisture wicking and temperature regulating effect of the mattress is the reason behind its superior comfort. It has a bamboo rayon blend which is silky to touch and maintains a steady air flow throughout the night, prevents moisture build up and regulates the temperature to its optimal range before you break into sweat at night. 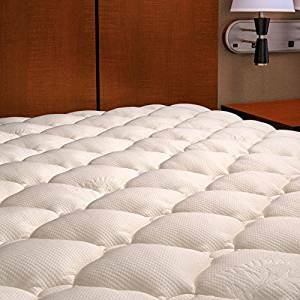 The plushness of the mattress pad also overpowers a stiff or uncomfortable mattress, and also highly increases the durability of your mattress. The product is easy to wash and is backed up with excellent customer service. Use it every day and enjoy a peaceful and undisturbed sleep with a dry and cool sleeping surface at all times. Sleep comfortably to a steady, ideal and optimal temperature with SleepBetter cooling mattress pad. It is a one of a kind product that regulates a balanced temperature and makes sure it isn’t uncomfortable for you at any point by being too warm or too cold. It has a flawless Outlast cover made from a high quality, breathable material and a visco-elastic memory foam that is gentle and comfortable. It conforms to the natural contours of your back and supports your neck and spine to relieve any aching joints or muscles. Enjoy restful sleep all night long with the Iso-Cool cooling mattress pad. 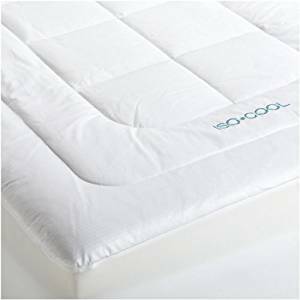 The SleepBetter Iso-Cool cooling mattress pad has a memory foam which is comfortable and plush to support the natural contours of your body. It is 3 inches thick and completely covers a Queen sized mattress with the dimensions of 58×77 inches. It fits well around the corners of the mattress with a 15 inches tight grip skirt which is 20 inches deep. It holds the cooling mattress pad firmly and doesn’t let it displace with movements. 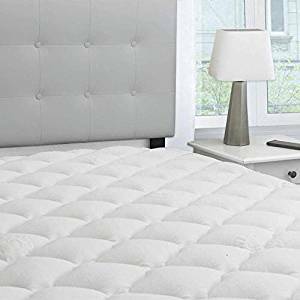 If you have an uncomfortable or firm mattress, this cooling mattress pad can turn it into a luxurious and restful 5 star bedding with its plushness and suppleness. The mattress pad has a 300 thread count and a 100% cotton cover that is breathable and cool. The cover of the cooling mattress pad is quilted with the superior Outlast adaptive comfort technology that ideally adapts to your body contours and gives you a cool and dry sleeping surface that is comfortable all night long. The RichLoft polyester fiber fill also has moisture wicking qualities and enhances the plushness of the mattress pad. It is hypoallergenic and prevents microbial growth. It also protects the mattress from getting damaged with mold, odor or stains. The product is made in USA and has a machine washable cover. Wash in cool water and tumble dry without the use of any harsh chemicals, bleach or ironing. The king sized cooling mattress pad by Warm Harbor ensures a cool and comfortable sleeping surface for you with a steady and balanced temperature and just the right amount of plushness to comfort and support your body. The high quality materials and superior design and technology guarantees an uninterrupted and relaxing sleep all night long. Convert your regular mattress into a 5 star hotel bedding experience with this amazing product and also add years to the longevity of it. The Warm Harbor cooling mattress pad fits a king sized mattress with 78×80 inches dimensions and 18 inches depth that fits well around the corners of your mattress. The skirt can stretch from 8 to 21 inches. The cover is made of pure cotton that is light and highly breathable. It maintains a steady air flow and has moisture wicking effect that prevents sweating and excessive moisture build up throughout the night. It also prevents the formation of odor or molding of your mattress by blocking out stains and allergic materials or microbial growth. There is 90 grams of fill per square meter of the topper, making it very plush and comfortable. The 130 GSM elastic fabric pocket, 300 thread count cotton cover, 83 GSM pongee reverse, 62 oz. combed cotton filling is very comfortable and greatly increases the life of your mattress. It also works well to make an uncomfortable or stiff mattress into a luxurious and plush bedding. The silky and breathable material of the mattress with a deluxe jacquard weave design regulates your body temperature and maintains optimal sleep environment. The moisture wicking effect causes evaporation over a large surface area and keeps your skin and sleeping surface cool and dry. It is highly durable and easy to maintain. The product is machine washable with cold water and can be tumble dried on low. Do not use iron or bleach and allow to dry naturally. Superior quality jacquard weave quilting. Extra fluffy multiparous fiber filling. The Zen Bamboo Ultra Soft cooling mattress pad is an easy and affordable solution to restless and disturbed sleep. The hypoallergenic material is gentle to your body and allows a unique temperature regulated environment that makes you comfortable and relaxed all night long. It conforms to your body’s contours and relieves aching and sore muscles. The moisture wicking technology ensures a dry and cool sleeping surface and prevent excessive heat up or sweating at night. It also adds years to the durability of your mattress. The long lasting and superior quality and design of the cooling mattress pad will give you ultra-comfort and support for years to come. It is made from 40% Rayon derived from Bamboo and 60% brushed microfiber fill that adds plushness and softness to the mattress pad. The product fits well around a Queen sized mattress and holds well around the corners to prevent any movement or displacement. The top of the cooling mattress pad has a unique and deluxe honeycomb baffle pattern that is much better than the regular diamond shaped weaves. It is more supportive and comfortable with a microfiber blend that is hypoallergenic and antimicrobial. Relax and renew with the Zen bamboo cooling mattress pad with just the right amount of lift to support the neck and spine. It not only provides comfortable and relaxed sleep but also protects your mattress and adds years to its durability. It safeguards the mattress against spills and stains. It also prevents exposure to dust mites, bacteria and fungus that can cause mold or odor formation. The hypoallergenic effect prevents any allergic triggers. The product is fairly low maintenance with a simple machine wash in cold water and tumble dry on low heat. Do not use bleach or harmful chemicals and don’t iron the topper. The product comes with a 30 day satisfaction guaranteed with full refund in case of dissatisfaction. The comfortable and plush Oaskys cooling mattress pad will enhance your sleeping experience and take it to the next level with its comfortable and high quality design and advanced technology. It is one of a kind cooling mattress pad with a deluxe and luxurious feel and look. Turn your ordinary mattress into a plush 5 star bedding. The breathable materials used for the manufacturing of the mattress are highly breathable and regulates the body temperature to keep your sleeping surface cool and dry all night long. The Queen sized cooling mattress pad has 300 thread count pure combed cotton surface that is highly breathable. It has 49 oz. filling that makes the surface soft and plush like sleeping on a cloud! The materials are hypoallergenic and antimicrobial. It reduces allergic triggers that make you wake up with flu like symptoms like sneezing and runny nose or any irritation and skin allergies. It also protects the mattress from dust mites, bacteria and odor formation. It keeps the sleeping surface clean, healthy and hygienic for you. It prevents excessive sweating due to its moisture wicking technology and superior quality. The snow down alterative fill is a state of the art fiberfill technology that gives you the feel of authentic goose and duck down without the use of actual feathers that poke or cause allergies. With upgraded thickness and more plushness, the product is tested by professional seeping testers. The square jacquard weave is superior to normal diamond quilting as it is more soft and supportive. The resilient elastic fiber pockets fit well around a Queen sized mattress. The product is machine washable in cold water and tumble dried on low heat. As it is packed in vacuum bag, it is recommended that you spread it out in the sun for a few days to let it regain its normal thickness and plushness. Do not use any harmful chemicals or bleach. Youmako Quilted Fitted cooling mattress pad is one of the best bedding products in the market. It is an affordable and luxurious product that turns your mattress into a plush and comfortable bliss. 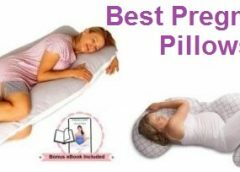 The material conforms to the natural contours of your body to relieve stress after a tiresome day and give you the restful and peaceful sleeping experience that you deserve. Say goodbye to waking up with allergic flu like symptoms or waking up in the middle of the night with excessive heat or sweating. The superior quality and durability of the product will give you an uninterrupted sleep throughout the night. 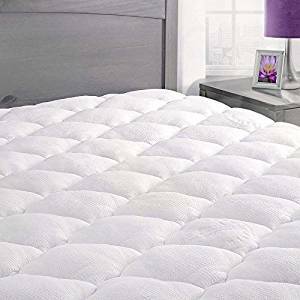 This cooling mattress pad is made with high quality and durable polyester fiber fill and 100% pure cotton cover that is highly breathable and light. It has a unique scientific knitting technology with braced force and is very supportive for your neck and spine. 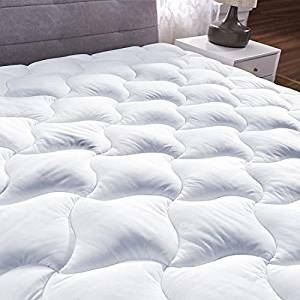 The mattress pad gives you the feel of an authentic duck’s down and goose down without the use of actual feathers that can be poking or trigger allergies. The hypoallergenic material ensures that you don’t have runny nose, sneezes or irritated and itchy skin when you wake up. It also prevents any stains, spillage, dust mites or mold on your mattress, which greatly increases its longevity. The resilient and high quality skirt is stretchable and fits well around a Queen sized mattress with a depth of 18 inches. It is well fitted around the corners to prevent any displacement during movements. The product is machine washable. Make sure that the water is cold and it is tumbled dried on low heat. Do not use any harmful chemicals, bleach or ironing on the mattress pad. The skillful double itching of the mattress topper prevents the formation of clumping or creases. Lay it in the sun for a few hours so it regains its fluffiness. The product is backed up with money back guarantee and excellent customer service. The product is thin but soft.